On August 17th HoneyLovers, beekeepers and honey bee enthusiasts across the country celebrated National Honey Bee Day to honor nature’s hardest working insect, and HoneyLove decided to celebrate with a Waggle Dance Flash Mob. We choreographed a routine and invited everyone to participate in person or by uploading a video. Special THANK YOU goes out to LUSH Cosmetics and all who joined in the festivities to help make it the best National Honey Bee Day EVER!!! 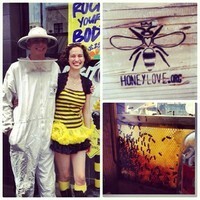 This Week in News features HoneyLove.org and National Honey Bee Day! National Honey Bee Day, 2013, Santa Monica. August 17th is National Honey Bee Day & a local non-profit organization, HoneyLove, celebrated in Santa Monica to help spread the message of how important it is to help bees. By: Christina Sarich, Natural Society. Many pesticides have been found to cause grave danger to our bees, and with the recent colony collapses in Oregon, it’s time to take a hard look at what we would be missing without bee pollination. In just the last ten years, over 40% of the bee colonies in the US have suffered Colony Collapse Disorder (CCD). Bees either become so disoriented they can’t find their way back to their hives and die away from home, or fly back poison-drunk and die at the foot of their queen. There are many arguments as to what is causing CCD, but the most logical and likely culprit is the increased usage of pesticides by the likes of Monsanto and others. A study by the European Food Safety Authority (EFSA) has labeled one pesticide, called clothianidin, as completely unacceptable for use, and banned it from use entirely. Meanwhile, the U.S. uses the same pesticide on more than a third of its crops – nearly 143 million acres. Two more pesticides linked to bee death are imidacloprid, and thiamethoxam. These are also used extensively in the US, while elsewhere, they have been taken out of circulation. Recently, the FDA also seized Terrence Ingram’s bees, a naturalist who had been studying bees for over 30 years, and had a colony that was resistant to Monsanto’s Round Up. Ingram’s prized hives, along with their queens, were destroyed by the FDA, and Ingram was given no warning that his bees would be demolished. If one of your favorites is on this list, you should consider becoming a bee activist. 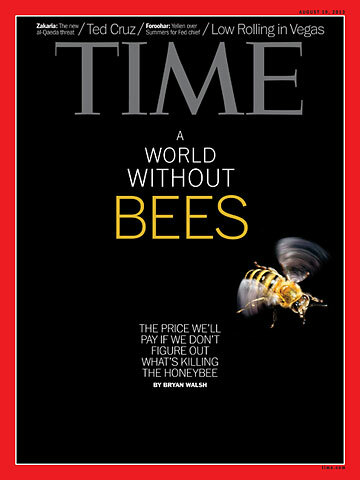 The beepocalypse is on the cover of TIME, but it looks like managed honeybees will still pull through. Wild bees—and wild species in general—won’t be so lucky in a human-dominated planet. I’ve written this week’s cover story for the magazine, on the growing threat to honeybees. You can read it (with a subscription) over here. The short version: beginning nearly a decade ago, honeybees started dying off at unusually and mysteriously high rates—this past winter, nearly one-third of U.S. honeybee colonies died or disappeared. At first this appeared due to something called colony collapse disorder (CCD); hives would be abandoned without warning, with bees seemingly leaving honey and intact wax behind. The apocalyptic nature of CCD—some people really thought the disappearance of the bees indicated that the Rapture was nigh—grabbed the public’s attention. More recently, beekeepers have been seeing fewer cases of CCD proper, but honeybees keep dying and bees keep collapsing. That’s bad for our food system—bees add at least $15 billion in crop value through pollination in the U.S. alone, and if colony losses keep up, those pollination demands may not be met and valuable crops like almonds could wither. But while we don’t now we exactly what causes CCD or why honeybees are dying in larger numbers, we do know the suspects: pesticides, including the newer class of neonicotinoids that seem to affect bees even at very low levels; biological threats like the vampiric Varroa mite; and the lack of nutrition thanks to monocultures of commodity crops like wheat and corn, which offer honeybees little in the way of the pollen they need to survive. Most likely, bee deaths are due to a mix of all of those menaces acting together—pesticides and lack of food might weaken honeybees, and pests like Varroa could finish them off, spreading diseases the bees don’t have the strength to resist. Unfortunately, that means there’s no simple way to save the honeybees either. Simply banning, say, neonicotinoids might take some of the pressure off honeybees, but most scientists agree it wouldn’t solve the problem. (And getting rid of neonicotinoids would have unpredictable consequences for agriculture—the pesticides were adopted in part because they are considered safer for mammals, including human beings.) 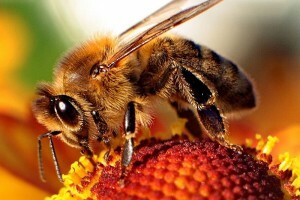 Honeybees are suffering because we’ve created a world that is increasingly inhospitable to them. Still, for all the alarm, honeybees are likely to pull through. As I point out in the magazine piece, beekeepers have mostly managed to replace lost colonies, though at a cost high enough that some long-time beekeepers are getting out of the business altogether. Beekeepers are buying new queens and splitting their hives, which cuts into productivity and honey production, but keeps their colony numbers high enough to so far meet pollination demands. They’re adding supplemental feed—often sugar or corn syrup—to compensate for the lack of wild forage. The scientific and agricultural community is engaged—see Monsanto’s recent honeybee summit, and the company’s work on a genetic weapon against the Varroa mite. Randy Oliver, a beekeeper and independent researcher, told me that he could see honeybees becoming a feedlot animal like pigs or chickens, bred and kept for one purpose and having their food brought to them, rather than foraging in the semi-wild way they live now. That sounds alarming—and it’s not something anyone in the beekeeping industry would like to see—but it’s also important to remember that honeybees themselves aren’t exactly natural, especially in North America, where they were imported by European settlers in the 17th century. As Hannah Nordhaus, the author of the great book A Beekeeper’s Lament, has written, honeybees have always been much more dependent on human beings than the other way around. 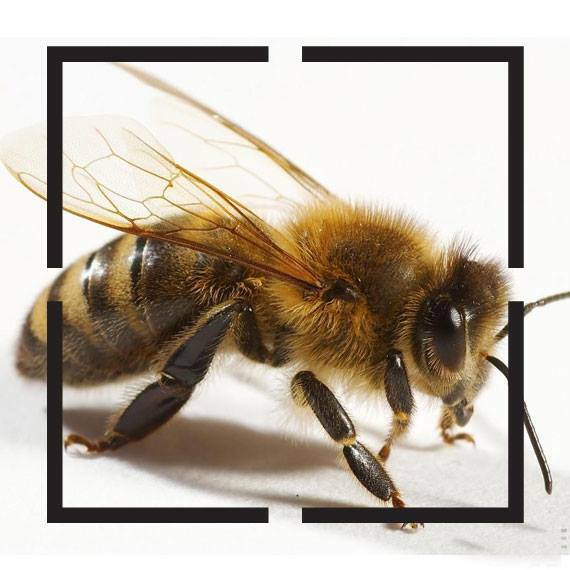 The reality is that honeybees are very useful to human beings, and species that are very useful to us—think domesticated animals and pets—tend to do OK in the increasingly human-dominated world we call the Anthropocene. But other wild species aren’t so lucky—and that includes the thousands of species of wild bees and other non-domesticated pollinators. Bumblebees have experienced recent and rapid population loss in the U.S., punctuated by a mass pesticide poisoning in Oregon this past June that led to the deaths of some 50,000 bumblebees. A 2006 report by the National Academies of Science concluded that the populations of many other wild pollinators—especially wild bees—was trending “demonstrably downward.” The threats are much the same ones faced by managed honeybees: pesticides, lack of wild forage, parasites and disease. The difference is that there are thousands of human beings who make it their business to care for and prop up the populations of honeybees. No one is doing the same thing for wild bees. The supposed beepocalypse is on the cover of TIME magazine, but “you don’t hear about the decline of hundreds of species of wild bees,” says Jennifer Sass, a senior scientist at the Natural Resources Defense Council. That’s meant almost literally—we don’t hear them anymore. The plight of the bees illustrates our outsized influence on the this planet as we reshape it—consciously and not—to meet our immediate needs. But just because we have this power doesn’t mean we fully understand it, or our impact on our own world. We are a species that increasingly has omnipotence without omniscience. That’s a dangerous combination for the animals and plants that share this planet with us. And eventually, it will be dangerous for us, too. 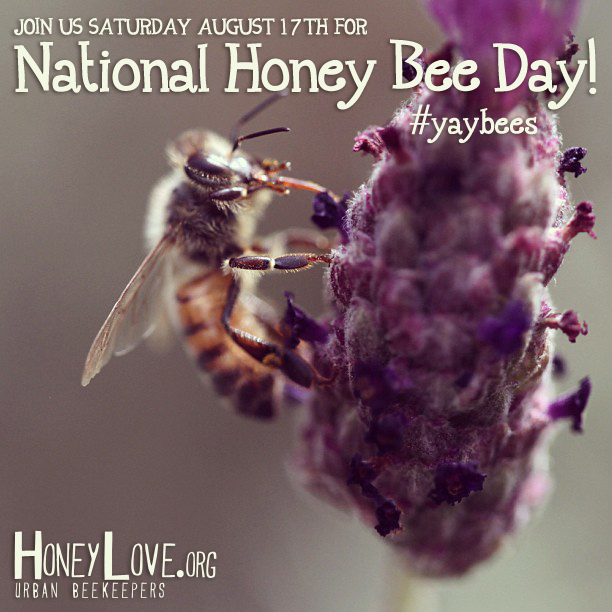 Join us August 17th for National Honey Bee Day! Learn the WAGGLE DANCE and send it to us to bee in our compilation video!! 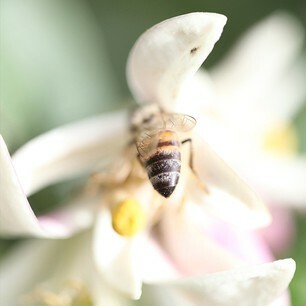 CLICK HERE TO LEARN MORE ABOUT NATIONAL HONEY BEE DAY!! In Kentucky, Project Pollinator is replacing grass with native flowers—and the early results for bees have been very promising. The prairies, sloughs and forests of the great North American continent are home to a dazzling array of flowering plants that nourish pollinators from bees to butterflies and hummingbirds (like a green beauty, probably a ruby-throated hummingbird, I saw feeding from a purple coneflower this weekend in my relative’s otherwise grass-dominated backyard in Indianapolis). But in case you hadn’t noticed, humans have the unfortunate habit of replacing these environs with crop fields and lawns. Perfect, manicured, American lawns. Both cornfields and lawns are examples of monocultures, swaths of land made up of identical species that provide little food and habitat for native pollinators. They are, in a way, wastelands for pollinators, as pointed out in a story at Scientific American. These beds of ubiquitous green blades, especially when sprayed with herbicides, offer virtually nothing to bees and other creatures on the hunt for food. Even when grasses are allowed to flower—which isn’t often, since unruly lawns are frowned upon and can decrease property values—most grasses are wind-pollinated and don’t need these animals to carry on their sessile lives. One initiative, called Project Pollinator, is replacing grass with native flowers in Kentucky. Emily Dobbs, a graduate student at the University of Kentucky, and colleagues have planted swaths of indigenous blooms at five golf courses in the state. The project, in its second year, is already having an impact, Dobbs said. 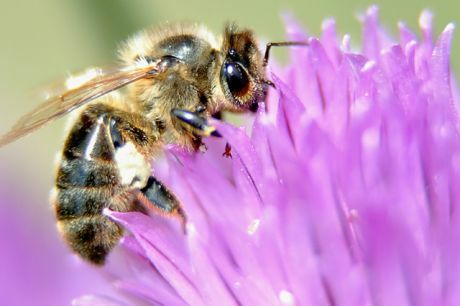 When they began the surveys on turf-dominated ground, the researchers mostly came across a single species of honeybee, besides bumblebees and sweat bees. But now, after introducing eight to 16 native species, Dobbs has found about eight bumblebee species, two dozen species of small solitary species like miner and diggers bees, and butterflies, she said. In the fall they will finalize their recommendation as to what mixture of native plants brings in the most indigenous insects. “We’ve seen much more diversity on samples we’ve taken from the Operation Pollinator plot than in surveys of turf,” Dobbs added. Thanks to the project, the Marriot, which owns many golf courses, has decided to place native flowers on half of its East Coast courses, according to Scientific American. For people who want to replace their grass lawns with native plants, “two of the most useful online resources are the websites of The Xerces Society, a nonprofit organization devoted to the conservation of invertebrates, and the Lady Bird Johnson Wildflower Center, a research unit of the University of Austin Texas dedicated to native plants,”Scientific American reports. Most states also have extension offices, run by their land grant universities, which can recommend native plants to buy. About one-third of the major industrial crops are also pollinated by bees and other insects. (Such is not the case with wheat and corn, which are mostly wind-pollinated.) Besides flowers cropping up along plots of turf, demand for native crops, pollinated by indigenous insects, has grown, Dobbs said. These include native squash, alfalfa, cranberries and blueberries, Dobbs said. Supporting locally-grown foods also helps conserve native pollinators. One contributor to the recent decline of honeybees may be the lack of diversity found in monocultures, research suggests. But this decline also highlights the importance of maintaining populations of local pollinators, many of which are indeed important for engaging in the dance of pollination that allows farmers to put bread (or cranberries) on the table. So what are you waiting for? Add some flowers to that lawn. The bees will thank you. How Fast Can a Honey Bee Fly? 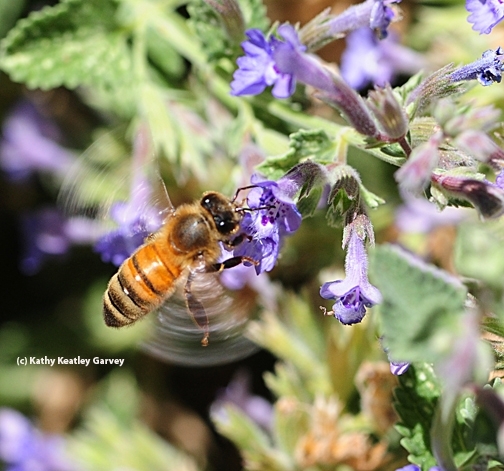 We captured these photos today of a honey bee nectaring on catmint (genus Nepeta). The bee was moving fast. To blur the wings, we set the shutter speed at 1/640 of a second with an f-stop of 13 and IS0 of 800. But just how fast can a honey bee fly? Its wings beat 230 times every second, according to Douglas Altshuler, a researcher at California Institute of Technology who co-authored research, “Short-Amplitude High-Frequency Wing Strokes Determine the Aerodynamics of Honeybee Flight,” published in December 2005 in the Proceedings of the National Academy of Sciences. The Hive and the Honey Bee, the “Bible” of beekeeping, indicates that a bee’s flight speed averages about 15 miles per hour and they’re capable of flying 20 miles per hour. If they’re not carrying nectar, pollen, water or propolis (plant resin), they’ll fly much faster!